Who is growing and why? Haryana and Kerala. Policy and position. Those are the short answers. Now let me expand on them a bit. For a long time, India’s major states occupied relatively fixed relative positions. Punjab and Haryana had prospered through the Green Revolution and were at or near the top of the heap in rankings of per capita state domestic product (SDP). Maharashtra and Gujarat also did well, with their commercial cities of Mumbai and Ahmedabad. The Bimaru states were clearly at the bottom: Bihar, Madhya Pradesh, Rajasthan and Uttar Pradesh, with Orissa also fitting the category if not the acronym. In the middle came the southern four, plus West Bengal. Now, of course, three of the five poorest states have been split. The table looks at some new data for 16 major Indian states. What does it show? You can see Haryana racing ahead. This is the Gurgaon effect, as that part of Haryana becomes like Delhi. 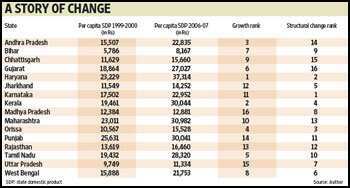 It has passed and surpassed Punjab in per capita SDP in the last few years. The other winner is Kerala. It used to be the state that had great human development but couldn’t manage to translate that into growth. Look at it now. It’s got everything going for it: natural beauty, educated people, decent governance. It’s matching Maharashtra’s average, but that disguises the extremes of Mumbai and the hinterland. And don’t forget Tamil Nadu, which is not far from Punjab now in per capita SDP. In 1981, Tamil Nadu’s per capita SDP was less than 60% of Punjab’s. Andhra Pradesh and Karnataka are not doing too badly. Their growth is good to middling (Karnataka did better just a few years earlier) and if they could extend their growth beyond their two biggest cities, they would be on a firm footing for the future. Kerala and Tamil Nadu have the advantage of many cities and towns that have strong economic activity: Their economic geography is more even. The scary part of the story is Madhya Pradesh and Uttar Pradesh. They are not only among the poorest, but are also consistently among the slowest growers. This is the heartland of the heartland, and its stagnation does not bode well. It could also be that the SDP figures paint too bright a picture for Chhattisgarh, Jharkhand and Orissa. Their mix of natural resources and tribal populations suggests that there may be bigger problems than are captured in SDP averages. The table also shows a ranking of structural change, based on an index of sectoral shifts. It is positively related to growth. This is new, and bodes well for economic dynamism in the future. Why the differences? Position matters: history and geography. The southern states share some common features in this respect. So do states with (or close to) the metros where the elite are thriving. Haryana is no longer in Punjab’s shadow as an agricultural state. The poor states, or the poor regions of other states such as Maharashtra and Karnataka, are all in India’s geographical core. It’s hard to escape geography. But policy matters too. You can see it in the fact that states’ relative growth rates change so quickly. You can see how policy unlocked the benefits of position. And policy even shaped history, in educating populations and breaking social barriers. For me, the fate of Punjab sums up the importance of policy. Its rulers fought over river water while wasting what was there, and destroying the water that is underground. They tried to preserve the economic status quo while the world changed around them. Bad policies and bad governance have squandered the state’s position and infrastructure. The good thing is that policies can change, and change quickly. One can always hope.